DocAgora, a nonprofit organization created to make the digital world comprehensible and useful to the documentary community, is the virtual brainchild of Peter Wintonick, co-director of the definitive profile of Noam Chomsky, Manufacturing Consent; Israeli-Canadian producer Amit Breuer (Checkpoint, Sentenced to Marriage); and American "webjockey" and director Cameron Hickey (Garlic and Watermelons). In ancient Greece, the agora was the crossroads where a marketplace was established and public debates would occur. Using classic forms of communication--debates, panel discussions and lectures--DocAgora is bringing a new marketplace of ideas to documentary festivals around the world. A self-styled "gypsy caravan" of practical philosophers, DocAgora has been plying its trade for a year now, in festivals ranging from IDFA to Silverdocs to Hot Docs. Joining Breuer and Wintonick as core members of DocAgora is a trio of distinguished individuals. Fleur Knopperts brings marketing and financing expertise to the group. The former director of IDFA's FORUM, where scores of documentaries have found broadcasting and financial partners, Knopperts has recently become the industry and marketing director at the Sheffield Documentary Festival in England. Replacing Knopperts as the IDFA rep is industry veteran Adriek van Nieuwenhuijzen, who has a wealth of knowledge on documentary filmmaking. Neil Sieling, American University New Media Fellow at the Center for Social Media, is recognized internationally as a consultant, TV producer (Alive from Off Center) and curator, who helped to launch a multitude of projects, including Link TV. This sextet of visionary media activists scored its initial North American success with an afternoon of spirited, well-structured debates at the 2007 Hot Docs festival in Toronto, Canada. 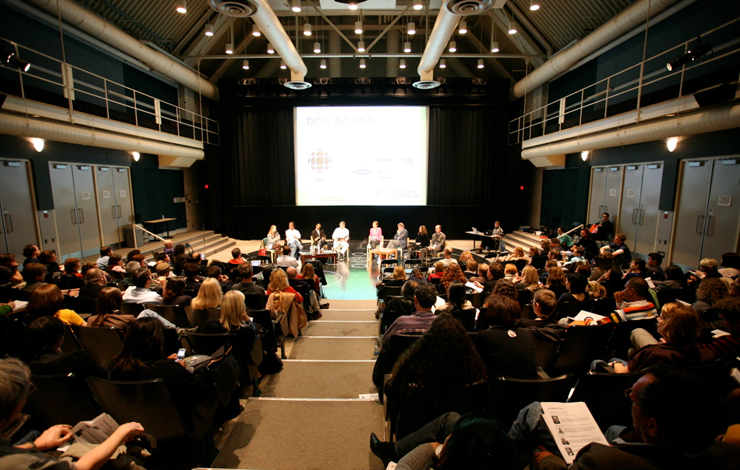 Seats were hard to come by as filmmakers, broadcasters, academics, producers and students jostled for space at University of Toronto's Innis Town Hall. The highlight was an Oxford Union-style debate organized around the proposition that "The authored documentary is a dead duck in the digital water." Arguing in favor of the proposition were activist director Daniel Cross (The Street, S.P.I.T. and creator of the website homeless.org); producer and cross-media creator Femke Wolting of the Dutch-based company Submarine (My Second Life); and the British-based communications academic Adnan Hadzi (Liquid Culture, Deptford TV). Arguing in favor of the auteur were director Jennifer Fox (Flying: Confessions of a Free Woman), new technologies student Brad Dworkin (Ryerson University in Toronto) and broadcaster/producer/writer Nick Fraser (BBC's Storyville). Operating as the moderator, Sieling pointed out that DocAgora questions the new digital age in "a Socratic manner without being pretentious." He set up the ground rules, keeping the speakers to a slightly loose five-minute time limit, announcing a "clap-o-meter" for an informal audience vote and explaining that Canadian veteran commissioning editor Rudy Buttignol would be the adjudicator for the debate. Cross brought the proceedings to life right away by announcing, "The water is poisoned, the ducks are dead and the auteurs ain't got no money--so we're going to win this debate." He then challenged the audience, asking all the auteurs to stand up and be counted. No one stood up, hardly surprising in a room full of reticent Canadians and international doc-makers. Cross' argument centered on the collaborative nature of documentary filmmaking, particularly in cinema vérité. Since the main camera operator, sound recordist and editor have so much to do with the making of that type of doc, Cross suggested that the director is simply part of the process, not an auteur. To him, the best documentaries have layers of authorship, not just a single vision. He concluded by pointing out that the website he has founded, www.homelessnation.org, welcomes that layering through blogs by street people, who are given cameras and encouraged to contribute pieces on issues ranging from police brutality to squatting. Counter-punching for the auteur side, the distinguished documentary director Fox passionately argued, "I live for authorship." To her, scientific and medical discoveries are authored. Even An American Love Story has become as much her story as the subjects' because she gave shape and structure to the documentary. Fox expressed her belief in "a singular vision" of filmmaking, replying to Cross' layers of authorship by suggesting that creative collaborators only work well when there's a link: the auteur. Next up, presumably for the collective, non-auteur side, was Wolting. The Dutch new media pioneer used to be a programmer at the Rotterdam International Film Festival and, while there, grew weary of the old-style auteurs, who seemed to always get funding and have their films included in prestigious festivals worldwide. While arguing against that style of auteurism, which smacks of elitism, Wolting did make a case for young "authors" being able to make their films with new digital tools. With YouTube, it is possible to distribute short films for free and bypass festivals altogether. A believer in the punk ethic DIY (do it yourself), Wolting ended up endorsing a "new age of auteurs," who are not members of a privileged class but simply the ones with the best ideas and methods of execution. Toronto new media artist Brad Dworkin followed Wolting to the podium, arguing on the auteur side. Dworkin pointed out that even Andrew Sarris, the critic who popularized the auteur theory in the US back in the 1960s, now admits that the old definition doesn't work anymore. Calling auteurism a "pattern theory in flux," Dworkin asked, "In a digital world, can we say the author is dead? I don't think so; it's in a new form: the website itself." Dworkin suggested that we look at an entire website as one work: the layout, the text, even the color. "The new auteurs," he went on, "are the creators of the search engines because they develop the programming, aesthetics and set the parameters, like a director of a documentary." Citing an experiment he conducted in collective authorship, where 20 feeds of Toronto were shot simultaneously, Dworkin noted that by setting the time, format and place, he was, in fact, the auteur. Even in digital work, he concluded, "the context of the exhibition and distribution" are handled by one person, who is effectively, its author or creator. Hadzi came to the debate highly prepared, as his PhD project is on "the author versus the collective." Taking the high road, he argued that "the author is in flux. The copyright is the dead duck in the digital water." Playing to the crowd as a tongue-in-cheek academic radical, Hadzi offered an astonishing amount of facts and speculation around new media technology. For instance, did you know that by 2015, your home computer will be able to store all the music created in the world? Or that by 2020, all the content ever created could potentially be stored in that same computer? Hadzi is a believer in "copyleft," a practice where directors and other artists voluntarily remove some usage restrictions from their own work. His ideas complement the "free use" access to archival materials, which the Center for Social Media advocates. For Hadzi, open licensing and common source technology will open up production and distribution for documentary filmmakers. And the auteur? Artists with singular visions will provide knowledge and wisdom to the collective voices that will spring out of the new panacea in the upcoming digital age. Leaving the visionary thoughts of Hadzi, Dworkin and Wolting far behind, the avuncular Fraser arose to deliver the final speech of the debate. The well educated and fearsomely amusing Brit suffers fools badly. He denounced famed French cultural theorists Deleuze and Baudrillard, who were obvious inspirations for Hadzi and Dworkin in particular. Fraser pointed out that "everyone in the debate basically agrees with one another," making it impossible to do what a true Oxford debater would do in conclusion: "Trash the enemies and praise our side." Apart from a nice but gratuitous aside praising Canadian media philosopher Marshall McLuhan ("Artists are the canaries in the coal mine. "), Fraser's conclusion was contentious but engaging: "The documentary shall survive made by individuals and collectives." As the adjudicator, it was up to Buttignol to deliver the final word. The clap-o-meter had already registered a resounding victory for the auteur side. An advocate of auteurism, Buttignol turned into a contrarian, admitting that he felt suspicious that the audience agreed with him. His conclusion was Jesuitical: "The argument is dead." Evoking yet another Canadian philosopher and scientist, Hubert Reeves, Buttignol left the audience with this thought: "Chaos and order co-exist." In other words, auteurs and collectives will always be among us. Doc Agora will certainly be with us for quite a while. The group plans to be a presence at this fall's Sheffield and Amsterdam documentary festivals. The future looms before them. Whether it's bright or not may well be the subject of another debate. Marc Glassman is the editor of POV, Canada's leading documentary magazine. 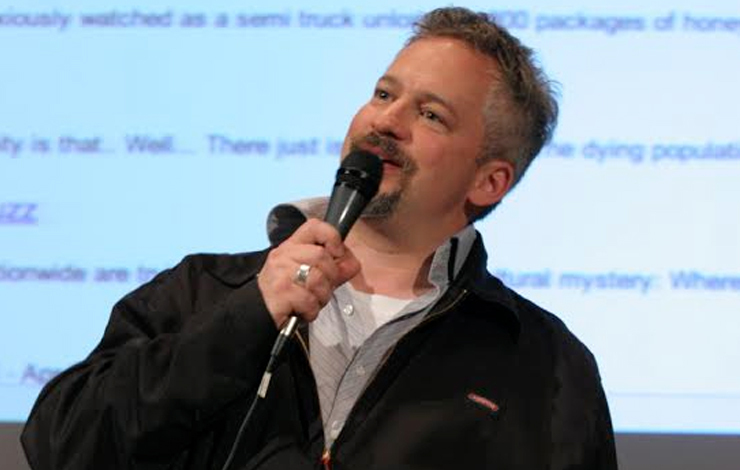 He is also the editor of Montage, for the Directors Guild of Canada and a freelance journalist in Toronto.